The Brookside 58 Inch TV Stand is a solid wood media center with rustic appeal. Designed to accommodate most wide screen TVs, this console has a solid wood center shelf for open access to electronic components. Four generous storage drawers keep movie collections and gaming accessories in one convenient place. Create a cozy space in your home with the Carson Electric Fireplace Console for TVs up to 70". This Fireplace TV Console allows you to enjoy the ambiance of the flame with or without heat, and it features a LED light source boasting up to 50,000 hours of life. The 2-toned look in a cherry and black finish gives this TV Stand a modern aesthetic sure to complement any rooms dicor. Distinctive styling and functionality make the Rochester media fireplace a standout. This electric fireplace can accommodate today's flat screen televisions up to 60 inches and electronic components. This unit includes a meda shelf to hold your components with a built-in wire management system. The (2) side cabinets include adjustable shelves to store your CDs & DVDs. The mantel is easy to assemble and is constructed from wood solids and veneers with a durable and lustrous Cherry finish. The fireplace heats up to 400 square feet and includes a multi-function remote control with temperature and timer functions built in. Complete your living room with the simple elegance of the Warm Shaker TV & Media Console. A central open area, closed side cabinets and two drawers allow for plenty of space for all types of media and gaming components. The central open area offers two adjustable shelves for media devices, while the closed cabinets each have one adjustable shelf. The pine unit also comes with cord management cutouts for an easy and clean installation. Display your TV in style with this corner wood media stand. Its space saving corner design provides optimal use and features adjustable shelving to fit your media components and accessories. Includes a cable management system to help maintain a tidy entertaining space. 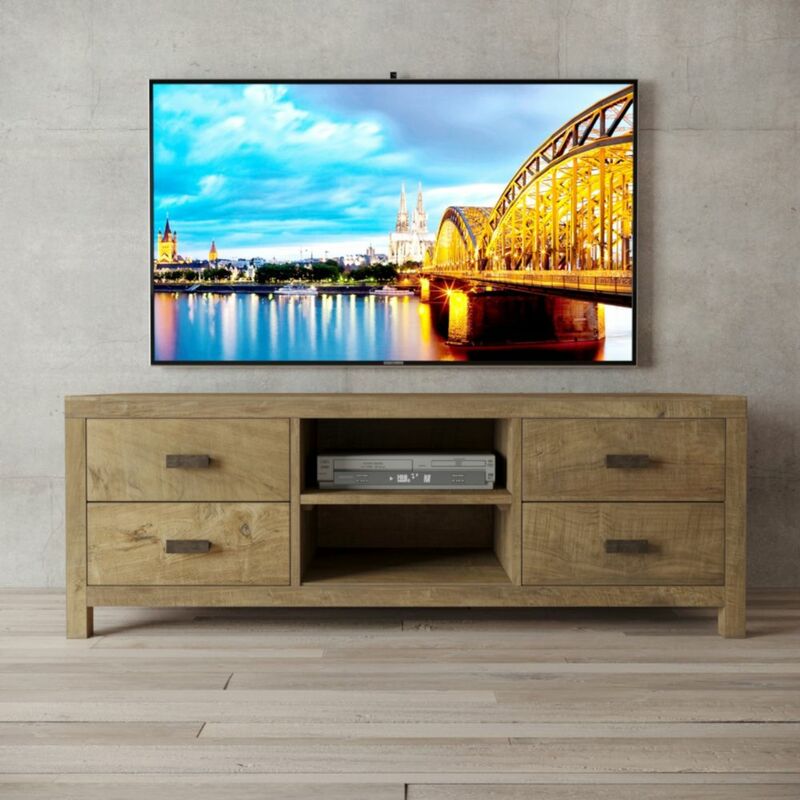 Crafted from high-grade MDF, this unit will accommodate most flat-panel TVs up to 60 inches. 58 Inch Brookside TV Console Natural The Brookside 58 Inch TV Stand is a solid wood media center with rustic appeal. Designed to accommodate most wide screen TVs, this console has a solid wood center shelf for open access to electronic components. Four generous storage drawers keep movie collections and gaming accessories in one convenient place.